Two weeks after the school shooting in Parkland, Florida, left 17 people dead, President Trump appears to have broken with the NRA and his Republican colleagues. At a televised White House meeting on Wednesday, Trump urged lawmakers to pass comprehensive gun control measures. Two weeks after the school shooting in Parkland, Florida, left 17 people dead, President Trump appears to have broken with the NRA and his Republican colleagues. At a televised White House meeting with lawmakers on Wednesday, Trump urged Republican and Democratic lawmakers to pass comprehensive gun control measures. At one point he accused Republican Senator Pat Toomey of being “afraid of the NRA.” After the meeting, NRA spokesperson Jennifer Baker said, “While today’s meeting made for great TV, the gun control proposals discussed would make for bad policy that would not keep our children safe. 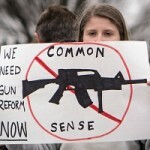 Instead of punishing law-abiding gun owners for the acts of a deranged lunatic, our leaders should pass meaningful reforms that would actually prevent future tragedies.” Speaking from Washington is Randi Weingarten, president of the American Federation of Teachers. She wrote an open letter to Trump on Wednesday explaining her opposition to his push to arm teachers. Also in Washington is Kris Brown, co-president at the Brady Campaign to Prevent Gun Violence. And here in New York is Andy Pelosi, executive director of the Campaign to Keep Guns Off Campus. Scientists are expressing dismay over unprecedented warm temperatures in the Arctic. In recent days, temperatures at the North Pole have surged above freezing—even though the sun set last October and won’t rise again until later this month. On the northern tip of Greenland, a meteorological site has logged an unprecedented 61 hours of temperatures above freezing so far in 2018. The record-breaking temperatures are connected to an unusual retreat of sea ice in the sunless Arctic winter. Scientists suggest warming temperatures are eroding the polar vortex, the powerful winds that once cushioned the frozen north. The alarming heat wave is causing scientists to reconsider even their bleakest forecasts of climate change. According to a leaked draft of a scientific report by a United Nations panel of scientists, “The risk of an ice-free Arctic in summer is about 50 per cent or higher,” with warming of between 1.5 and 2.0 degrees Celsius.